David Nixon's ballet captures the decadence of the 1920s to perfection. F. Scott Fitzgerald’s classic coming of age novel The Great Gatsby portrays the Jazz Age in vignettes rich with imagery. 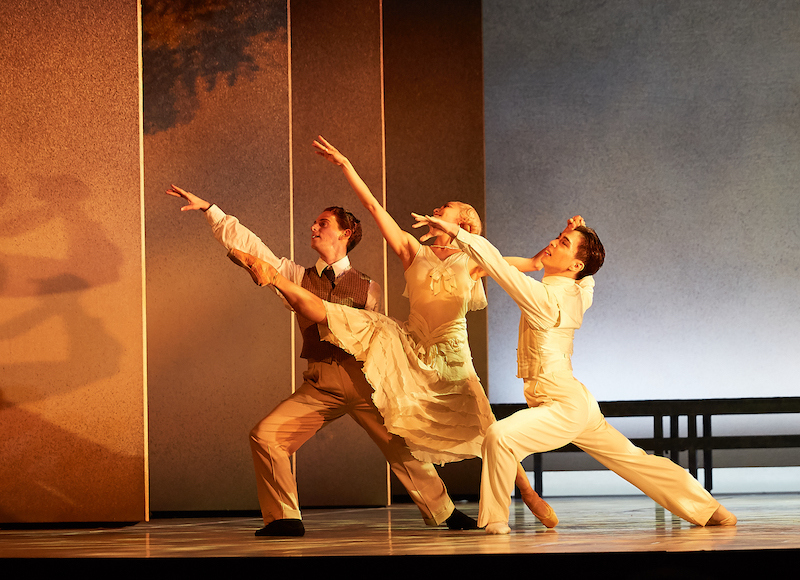 The story has since been re-imagined by film makers and in 2013 by Northern Ballet director David Nixon. 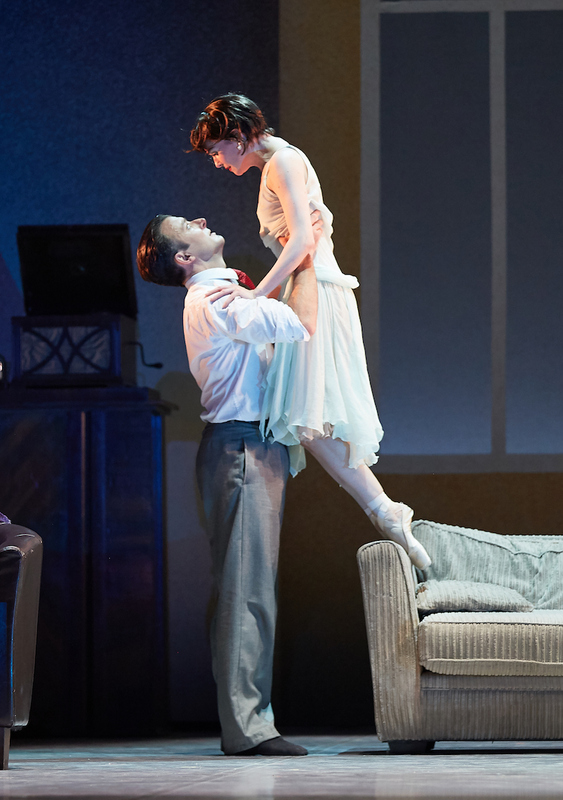 The lavish parties and iconic music of 1920’s America makes it an appealing genre to set to ballet and Nixon’s production captures the decadence and superficiality to perfection. The ballet was given its Australian premiere last night by the West Australian Ballet as part of artistic director Aurélien Scannella’s plan to expand the company’s conservative story ballet repertoire. There were feathers and sequins galore in Dixon’s beautiful costumes: dancers floated haughtily across the stage and men in tail coats oozed good manners. Jerome Kaplan’s fluid set used sliding screens to create rooms with white curtains and large windows evoking grandeur. Tim Mitchell’s moody lighting was particularly stunning in creating a creamy opulent glow for Daisy and Jordan to lounge in feminine elegance. But it is a tall task to distil the imagery and irony of language into a wordless ballet. There was a lot of mime and stock gestures used to establish character and narrate the story of a man relentless in his pursuit of a beautiful dream. Nixon used flashbacks to recount Gatsby’s early relationship with the young Daisy (costumed with the virginal sweetness of Little Bo Peep) and his links to the gangster underworld. Richard Rodney Bennett’s music helped wonderfully. The score was a neoclassical medley of jazz numbers, orchestral music and excerpts from his film scores (Murder on the Orient Express, Nicholas and Alexandra) linked surprisingly seamlessly by orchestrator John Longstaff. The breathless energy of downtown New York was depicted in the swirling string phrases of Billion Dollar Brain, lush quotations from Partita for Orchestra set the tone for the reunion between Daisy and Gatsby and the Percussion Concerto was a nerve-rattling accompaniment to the Act II scene at Wilson’s Garage. Conductor Myron Romanul guided the WA Symphony Orchestra (and supplementary rhythm section) adeptly through the different styles with some magical solo moments from clarinet, horn, accordion and saxophone to name just a few. Pianist Graeme Gilling was the lynchpin, turning out ragtime numbers and atonal passagework with rock steady assurance. The corps de ballet filled out the party scenes, moving through tangos, Charlestons (danced en pointe!) and a congo line, even singing along loudly to a recording of When the Midnight Choo Choo in a stand out scene in Myrtle’s apartment. Pre-recorded music was used again in the finale but felt more contrived; Gatsby’s dream of waltzing with Daisy into a pink sunset was accompanied by I Never Went Away sung by Bennett. The transition to recorded music was clunky but it was also the most moving pas de deux of the night, as Matsui and Nomura let down their emotional reserve. On Thursday night, Oliver Edwardson was a youthful and observant Nick Carraway, bewitched by the disdainful coolness of Jordan (Brooke Widdison-Jacobs with her impossibly long, elegant legs). Matthew Lehmann was a swaggering, possessive Tom and Melissa Boniface was larger-than-life as his lover Myrtle. Her husband Wilson, the garage owner, was danced with angular conviction by Liam Green, who gave a particularly moving grief scene accompanied by a low brass chorale. Chihiro Nomura was a delicate Daisy, flitting constantly and tossed breathtakingly between the men but unable to be pinned down by Gatsby. Gakuro Matsui was Gatsby: clinical, aloof and ruthless in the pursuit of his dream. None of the characters were unreservedly lovable; like Fitzgerald’s novel Nixon encouraged his audience to critique the flawed characters while still creating a work of enthralling beauty. An impressive accomplishment for Nixon and the team at WA Ballet. Discover Bennett’s choral music in excellent performances. We finish our round up of the shows that excited us most in 2018 with a look at dance. Shimmering pas de deux between the Prince and Cinderella, and deliciously witty choreography for the stepmother and stepsisters make a great holiday treat. Highlights include new full-length ballets by Graeme Murphy and Stanton Welch, Les Ballets de Monte-Carlo in Lac, and a new Resident Choreographer. A stunning and powerful contemporary rendering of an ancient story.